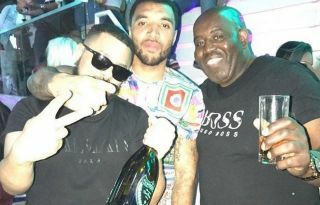 AFTV host Robbie Lyle is clearly enjoying the international break as he shared an image alongside Troopz and Troy Deeney from the weekend. The trio are all out in Dubai it seems over the break, and they just so happened to cross paths, as seen in the images below. Meanwhile, Alexandre Lacazette was also snapped with the AFTV duo, who will be hoping that he can continue to fire them towards their objectives this season. Arsenal remain in the hunt for a top-four finish in the Premier League as well as trying to win the Europa League, and so they’ll undoubtedly be busy regrouping during their training camp in Dubai. It remains to be seen what Hector Bellerin makes of this love-in with Deeney though, with the Spaniard having exchanged a few digs with the Watford man through the media in recent times.